Screensharing is a useful feature that allows you and your participants to share application windows or your/their desktop. 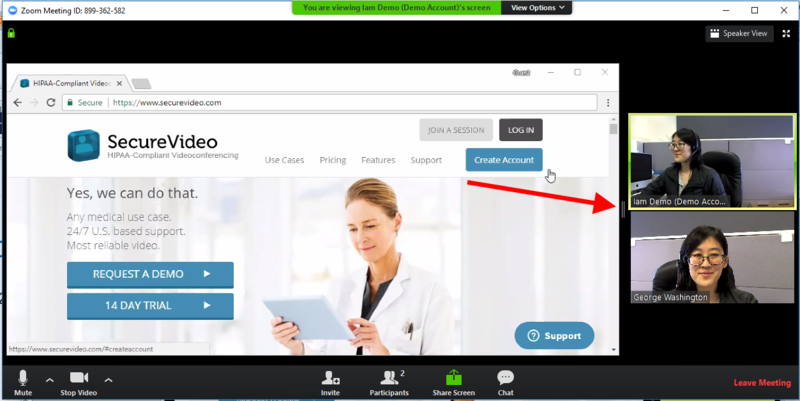 This article illustrates how to view and interact with shared content on a Zoom-based call. Once another participant shares their screen, the video windows will shrink and be cast to the side, giving more screen real estate to the content being shared. 1. Click anywhere on the video window to make a menu appear. At the top of the screen, you should see a green confirmation message that you are viewing another participant's screen, with an "View Options" menu. Original Size: Will resize the shared screen so that it matches the size as it is on the screen of the person sharing it. Request Remote Control: Request mouse control for the shared screen, from the person sharing it. Annotate: Makes visible a slate of drawing tools. Side-by-side Mode: Causes the shared content to be displayed in the same window as the participant video feeds, allowing you to change the side of one in proportion to the other. 2. 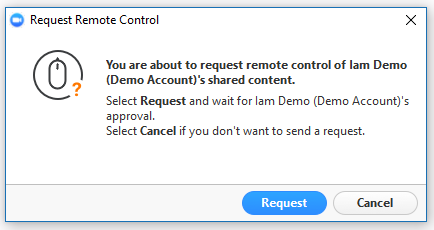 If you request remote control, you will first see a confirmation message. Click "Request" to proceed, and the sharer will see a message asking for permission to give you remote control of their shared content. If granted, a notification message will appear on your screen. 4. Side-by-side mode causes the shared content to be displayed in the same window as the participant video feeds. If you move your mouse to the space in between the shared screen and the participant video feeds, you'll see a pair of vertical-lines. Click and drag from that point to change the width of the shared screen and participant video feeds. 1. In the lower left hand corner, tap on the pencil icon. When a screen is being shared, all video windows minimize. Other participants on the call will not see your video feed for the duration of the share. Arrow: Create a line with an arrowhead. If the shrunken video window is in your way, click on the "plus" sign icon to expand and then the "minus" sign to completely shrink it. 1. In the lower left hand corner, tap on the pencil icon to expand annotation tools. If the video window gets in your way, tap it to minimize it to a camera icon. You can tap it again to expand later. 2. Drawing tools will appear (and will also displace any video windows for the time being). Click on the pencil icon again to remove the tools bar. This article was last reviewed by our Support team on April 5, 2018.